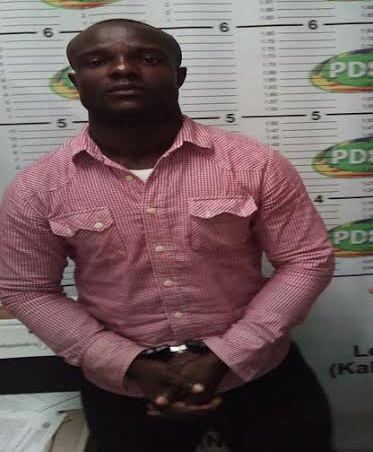 A Nigerian, Ejike Okoye, was nabbed on Tuesday by joint elements of the Philippine Drug Enforcement Agency Region 3 (PDEA RO-3) and PDEA-National Capital Region (PDEA-NCR) in a drug sting inside a resto bar along Sumulong Highway in Philipine. He was caught in the act. According to Manila Bulletin, 33-year-old Ejike (alias "Martin") is said to be a member of West African Drug Syndicate operating in Metro Manila and nearby provinces of Central Luzon. PDEA RO-3 director Emerson Margate revealed that PDEA RO-3 agents were able to secure a drug deal from Okoye to purchase of 300 grams of shabu for PHP360,000. They agreed to meet inside the resto bar in Marikina City. That was where they arrested the suspect. Confiscated from the Ejike were six medium-sized resealable transparent plastic sachets containing a white crystalline substance suspected to be shabu with a street value of PHP1,050,000 and the marked money used in the anti-drug operation. Ejike was brought in PDEA Jail Facility in the City of San Fernando for further investigation.